My favourite “bad” character is Flip, a sullen, difficult, way fashion-forward… assistant seems the wrong word for her. 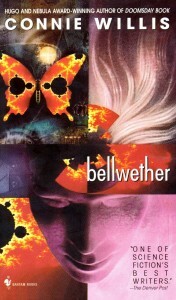 She appears very early in Connie Willis’ charming novel of chaos theory and fads, Bellwether. I have never disliked someone so much within a sentence of their arriving on the page – and in the guise of a character I expected not to see again. Oh! She ought to be a minor character and yet she’s like a cross between Dolores Umbridge from Harry Potter and Judy “You bring chaos and destruction to everyone, but why me? Why me?” Maxwell from What’s Up Doc. I say ‘between them’ because while she’s not actively malevolent, neither does she have Judy’s light-hearted oblivion. Unpredictable, unreliable, self-absorbed, unpleasant but not trying to please, human when it’s least convenient – she exists magnificently, awfully, on her own terms, without reference to what others think. She’s a wonderful example of Willis’ skill (I adore Willis long novels, but this is a remarkably short, dense, delightful little one), of opposition without villainy-as-such, of emotive characters, of theme worked out in a character, in how you can react violently to even the first few introductory words and yet finish shaking your head in admiration. This entry was posted in News, On Writing: General, On Writing: Short Stories, On Writing: The Novel and tagged Bellwether, Connie Willis, Harry Potter, kathleen jennings. Bookmark the permalink.